If you're a tiny zooplanktic animal, that is. Two species of the planktic nudibranch Glaucus (G. atlanticus on the left and G. marginatus on the right). 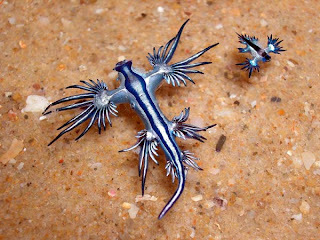 Glaucus is a member of the Aeolidioidea, and like other aeolids it feeds on cnidarians (siphonophores and chondrophores in the case of Glaucus) and sequesters their stinging cells for its own defense. Photo by Gary Cobb. 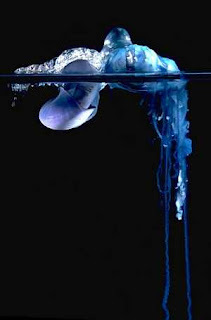 Janthina feeding on a Portuguese man-of-war, Physalia. Photo by Bill Rudman. The sea angel Clione belongs to one of the larger groups of pelagic gastropods, the Gymnosomata. Together with another group, the Thecosomata, they have been classified into the Pteropoda, characterised by the adaptation of the foot into a pair of 'wings' for swimming. 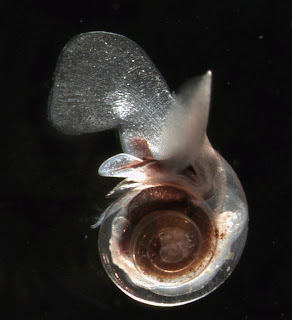 Recent authors have disagreed as to whether or not the pteropods form a monophyletic group (with probably the majority favouring "not"), or whether gymnosomates and thecosomates took to the seas independently, but pteropod monophyly was supported by Klussmann-Kolb & Dinapoli (2006). Pteropods have an interesting taxonomic history. When Cuvier first established the group in 1804, he regarded them not as gastropods but as a separate order in their own right. Pteropods seem to have been regarded as a link between gastropods and cephalopods, with some believing them closer to the latter than the former. Even after the modern pteropods were well-established to be gastropods, and 'Pteropoda' often abandoned as a formal category, the name maintained a strange shadow existence in palaeontology, with many Palaeozoic fossil problematica such as tentaculitoids, hyoliths or even conulariids (almost meaninglessly) regarded as or compared with "pteropods". Limacina helicina, photographed by Russ Hopcroft. Klussmann-Kolb, A., & A. Dinapoli. 2006. Systematic position of the pelagic Thecosomata and Gymnosomata within Opisthobranchia (Mollusca, Gastropoda) – revival of the Pteropoda. Journal of Zoological Systematics and Evolutionary Research 44 (2): 118-129. Is it just me, or is there something fishy going on with Glaucus? Mimicry? Functional convergence (I suppose that's unlikely if it's planktic)? I suspect functional convergence, with a soupçon of sheer coincidence. If I was mimicry, I can't really imagine what it would be supposed to be mimicing. The 'fins' are obviously clustered and extended cerata, and my first guess would be that that arrangement of them helps the animal maintain buoyancy by increasing the area-to-mass ratio. There may also be a defense factor, seeing as the cerata are where the sequestered nematocysts are located, but I wouldn't know whether that arrangement of cerata is any more effective for defense than any other possible arrangement (except that the normal benthic aeolid arrangement of cerata along the back wouldn't be much use for a planktic species that is more likely to be attacked from below).